Charles Caraguel focused his education and training on the health and welfare of aquatic species. After graduating from the National Veterinary School of Toulouse (France), he obtained a specialized veterinary school diploma in aquaculture and fish pathology (Nantes, France). Drawn by the expertise of the Atlantic Veterinary College (PEI, Canada), Charles completed a Master of Science degree at the Lobster Science Centre where he developed a diagnostic test using molecular techniques to detect and characterize a pathogenic amoeba, Neoparamoeba spp.. Taught by worldwide recognized fish health experts, he further developed and extended his knowledge on pathology of mollusc, crustacean and finfish during this program. 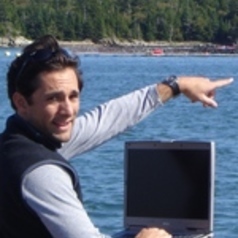 Recognizing the importance of population medicine in aquaculture where massive populations of animals are involved, Charles pursued his graduate training with a PhD in aquatic epidemiology through the Centre for Aquatic Health Sciences (AVC). He investigated the performance and use of diagnostic tests in fish disease surveillance and control programs for Infectious Salmon Anaemia virus. This experience provided him with specialized training to identify, investigate and analyse fish health that is problematic and directly impacts the sustainability of aquaculture industries. Overall, Charles’ goal is to improve understanding, establish evidence, and develop more effective health risk identification and management in the aquaculture industry using epidemiology of infectious and non-infectious diseases.